The Caribbean Cup Tennis Series is a celebration of tennis in the Caribbean! Every tournament brings tennis players from around the globe Japan to Finland and supports local youth development in the community, and proceeds from each event go to local charities - while also boosting the economy with increased tourism and economic impact in the off-season! 7 countries, 8 events, 1 Cup. Boys U18 and Girls U18 winner is determined by the total number of singles ITF points accumulated at the end of the Caribbean Cup Tennis Series which is comprised of Jamaica, Barbados, St. Vincent, Anguilla and Antigua and Barbuda Cups. Adults are determined by the most total points earned during the Caribbean Cup Tennis Series which is comprised of Jamaica, Barbados, St. Vincent, Anguilla and Antigua and Barbuda Cups. There will be one male and one female overall winner. Both Singles and Doubles points count towards your overall total. Our events were covered internationally by the ATP, Rogers Cup, Tennis Life, the PTR, and Tennis Canada outlets. "Karl and his team at Sports Travel Experts run first class events. When we announced the Anguilla Cup, I immediately renovated our 6 courts to host the event. The result was an amazing event with records crowds featuring German Davis Cup star Philipp Kohlschreiber who played an exhibition. 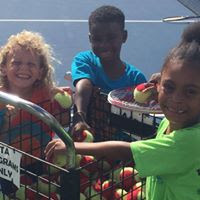 What has followed since we have the renovated courts is: more locals tournaments, more enrollment at our programs and increased participation as a whole. The Anguilla Cup is now an annual event that our children and our top players work towards, also earning a trip to the Rogers Cup!"